In this week’s Mad Genius Tips video, F&W’s Justin Chapple revealed the easiest way to poach salmon in BPA–free sandwich baggies. Here, six things to do with all of the poached salmon you’ll have after mastering the technique. In this week’s Mad Genius Tips video, F&W’s Justin Chapple revealed the easiest way to perfectly cook salmon by poaching it in BPA–free sandwich baggies. Here, six things to do with all of the poached salmon you’ll have after mastering the technique. 1. Make a retro classic. This old-school salmon-tomato aspic was inspired by Andrew Zimmern’s grandmother. 2. Serve it for brunch. 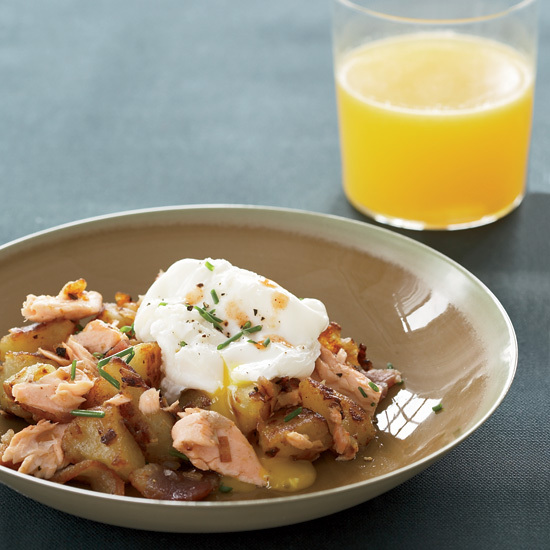 Leftover salmon is delicious in hash topped with poached eggs. Pair healthy poached salmon with crisp lettuce and tender spring asparagus for a light and healthy meal. 4. Try your hand at a soufflé. This elegant, savory salmon soufflé is ready in just an hour. 5. Use it as an excuse to eat more butter. Complex, shallot-y, winey beurre blanc is the perfect sauce for rich salmon. Served with an easy, no-fail hollandaise, poached salmon is the perfect dinner party dish.